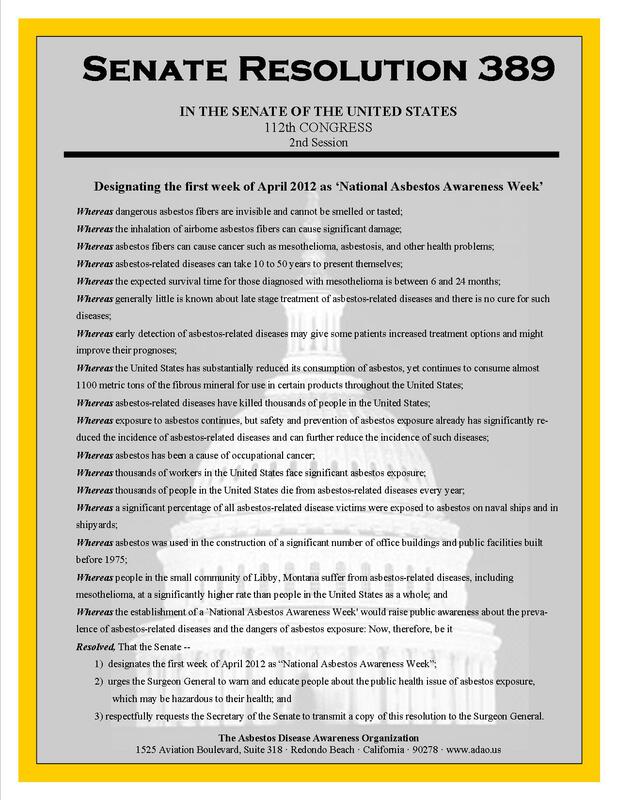 Motley Rice proudly joins the Asbestos Disease Awareness Organization (ADAO) in congratulating the U.S. Senate for unanimously passing Senate Resolution 389, legislation which designates April 1 - 7 as National Asbestos Awareness Week to "raise public awareness about the prevalence of asbestos-related diseases and the dangers of asbestos exposure." An avid supporter of ADAO, Motley Rice was excited to contribute to the organization this year, helping it to gather the resources necessary to push for this important resolution. This marked the sixth time that Montana Senator Max Baucus has introduced this resolution, so we are pleased that it has finally passed and believe this to be an important first step towards increasing public awareness about asbestos exposure. ADAO, founded in 2004 by victims of asbestos exposure and their families, is a global organization that works to raise awareness about the dangers of asbestos exposure and support asbestos victims through education, advocacy and community. "ADAO will continue to work with Congress to prevent asbestos exposure to eliminate deadly asbestos-caused diseases. Every life lost to a preventable asbestos-caused disease is tragic; hundreds of thousands of lives lost is unconscionable," said Linda Reinstein, ADAO President and Co-founder, in a congratulatory message to the U.S. Senate. Read ADAO's congratulatory message to the Senate. Learn about ADAO's 8th Annual International Asbestos Awareness Conference, Asbestos: "An International Public Health Crisis," being held March 30 - April 1, 2012, in Los Angeles. Our attorneys pioneered the fight against asbestos manufacturers that began more than 30 years ago when Motley Rice co-founder Ron Motley helped uncover documents exposing the asbestos industry's wrongdoing. He and co-founder Joe Rice also litigated some of the first mass personal injury class action cases to be tried and won by asbestos plaintiffs. Since then, our attorneys have represented more than 100,000 asbestos victims in the U.S. justice system, including more than 6,500 Canadians. We remain at the forefront of asbestos litigation and continue to advocate for the rights of workers and other victims of negligence and wrongdoing. Learn more about how Motley Rice asbestos lawyers represent U.S. and Canadian asbestos victims and fight for compensation and accountability on their behalf against companies that manufactured, distributed or supplied asbestos-containing products.